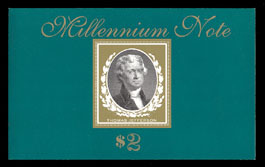 "Special" paper money, which is to say banknotes and related made for presentation to dignitaries or for sale to collectors, is as old as USA paper money itself. "Specimens" aside, there are things from the 19th century on: specially watermarked paper, uncut sheets, special serial numbers, etc. Of late the Bureau of Engraving & Printing has been pumping out the specials, some of which are pretty silly, at least to me.